Erin Kirkland is an Anchorage writer, mother of two, and the owner/publisher of AKontheGO.com, a website dedicated to family travel and outdoor recreation in Alaska. She is a regular contributor to Kids These Days!Radio, blogging under the title "KTDontheGO! ", and is cohost of the Alaska Travelgram Show, heard on KOAN 95.5 FM in Anchorage. Got your hippety-hop on, this morning? You’ll sure need it to get anywhere in the 49th state, lately. 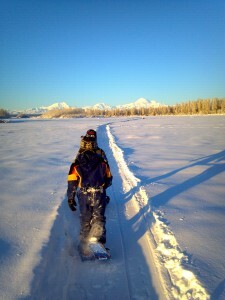 There’s more snow than most of us have seen in a long time, and aside from shoveling it all into an enormous cone-shaped configuration in the front yard, one activity in particular comes to mind – snowshoeing. Way more fun, too.